Creating Instagrammable moments is now part of architectural briefs as more restaurants vie for free publicity, social kudos & the genuine footfall created by growing quest for the perfect selfie. Earlier in the year architect Farshid Moussavi sparked debate when she shared an image of hotels "advertising themselves not for their comfortable beds but for their Instagram spots". Vale Architects have also produced a guide that argues that Instagram now plays a key role in the success of hospitality projects. The report suggests that architects and designers need to understand how designs can encourage guests to share their surroundings, and thereby boost the venue's profile and business. Tips include integrating "funky murals" and adding neon quotes to walls. 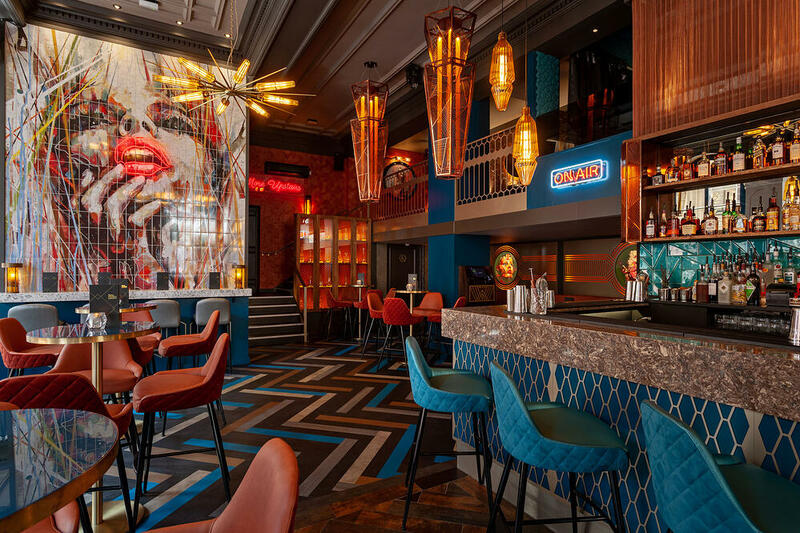 We highlight 10 of our most Instagrammable projects of late, from crazy golf to avocados-only with a healthy hit of floral decor & neon signage (see Dirty Martini Birmingham above - Photo by Michael Franke). Pink chairs outdoors and floral features outdoors and in guarantee a the perfect shot whatever the weather. Dubbed "London's most Instagrammable cafe" by the Metro the brand has expanded to open a brand new location in Oxford Circus with a second at Selfridges on the way. Our Nolita armchairs, shown below, were ordered in a bespoke shade of pink specifically for this project. Avocados, like Instagram, have also been on the rise for a while, becoming one of the most snapped foodstuffs. Naturally a venue that puts avocados centre stage in their menu and has interiors infused with a botanical healthy living aesthetic, was going to do well on the network. Feya is of a similar ilk to the Elan cafes with pink velvet chairs and ceilings adorned with flowers, and is particularly popular among lifestyle bloggers and Instagram influencers. Many a smiling lady can be seen across Instagram living their best life while brandishing a cupcake from within these four walls. Sister venue and conjoined twin to London's only ball pit bar - Baillee Ballerson, Rascals has a lot to compete with when grabbing the social limelight. But the pink wallpaper, neon signage, and seemingly constant stream of drag entertainment as well as London's only waterproof dining room for adult messy play sessions means the venue always packs a punch on Instagram. See more images of Rascals here. 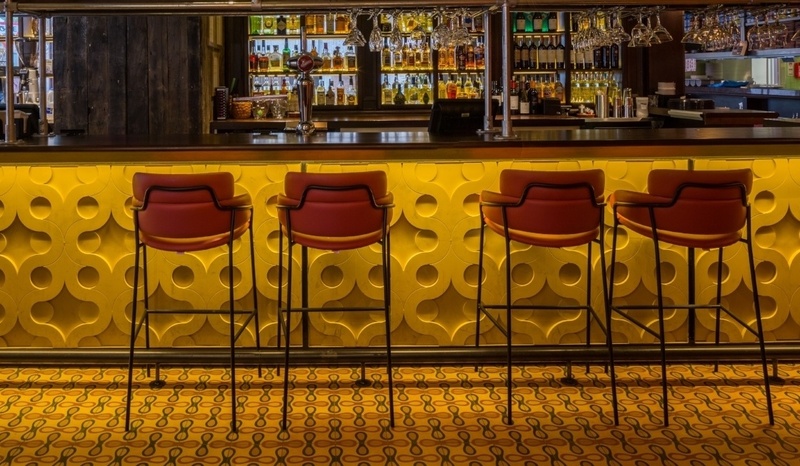 Bounce Farringdon has just had a major refurbishment featuring more neon than ever before. As well as standard ping pong, the venue offers Wonderball, using state of the art projection mapping, where each Wonderball table becomes a giant computer game, introducing a whole new way for groups to play. The interiors give a futuristic appearance that lends to Bounce's state-of-the-art appeal that you can't do this - or take a photo of this - anywhere else. We love the Grind venues, and we couldn't resist including a photo of the interiors with two loveable pups. Because nothing is more Instagram than great design, pink cocktails and pugs. View more images of Clerkenwell Grind here. Using ground-breaking patented technology to catapult the traditional game of mini golf into a cutting edge gaming phenomenon was always going to produce a photo-op or two. The neon interiors featuring light tubes and glowing golf clubs, retro slot machines and 80s gaming graphics further catapult the player into the game and make for a supremely immersive experience. Terrazzo is the material of the moment, and Omar's Place has an entire sea of it. The green bar tops and tables make for a brilliant backdrop to take images of the tasty tapas on offer in this Mediterranean hotspot. All the Dirty Martini bars excel at neon signage and striking, on-brand feature murals. DM Birmingham features this particularly ingenious installation of neon angel wings, which has proved extremely popular due to its easy stand and snap formula. Is this the modern day version of those photo-cut out boards you'd get at the seaside? Probably. View more of the Dirty Martini Birmingham interiors here. There are two Flight Clubs in the UK with more on the way this winter. With their fairground facades and multi-sensory darts they promise the perfect combination of newfangled gadgetry and nostalgic Victoriana. This is a veritable smorgasbord of visual delights for any snap-happy Instagrammer.